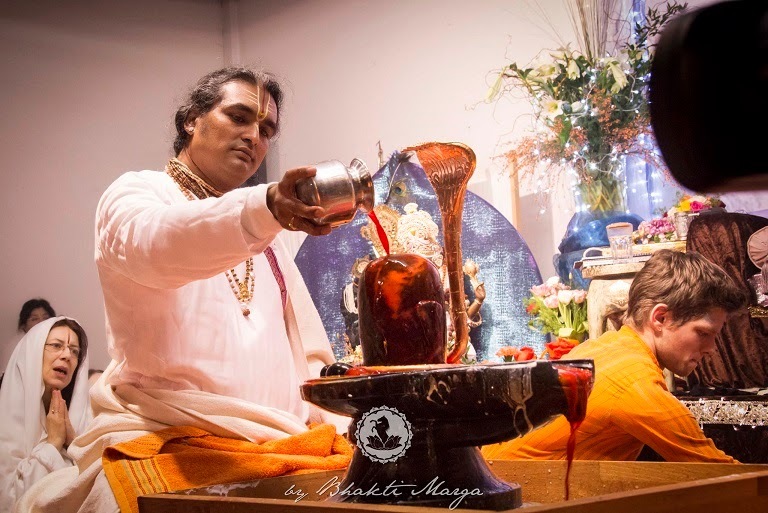 The Celebrations of Maha Shivaratri at Shree Peetha Nilaya took place for 24 hours from dawn of Tuesday, the 17th of February until the dawn of Wednesday, the 18th of February. 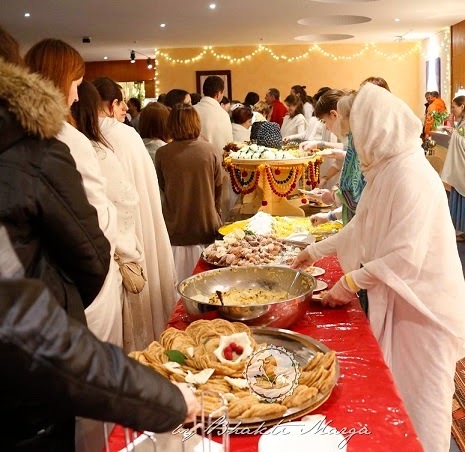 It included the first prayer performed on Tuesday morning, and the Char Pahar, which are the most important prayers - the four abishekams done during the great night of Lord Shiva. The first pahar started at 18:00 hours and the others followed approximately every three hours at 21:00, 24:00 and 3:00. 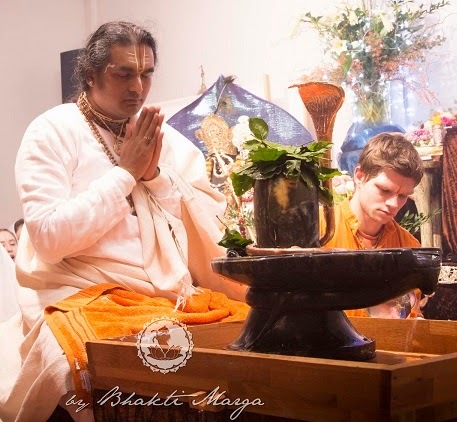 The first prayer started with Guru puja, Guru Paduka abishekam, Kalash puja and homa. 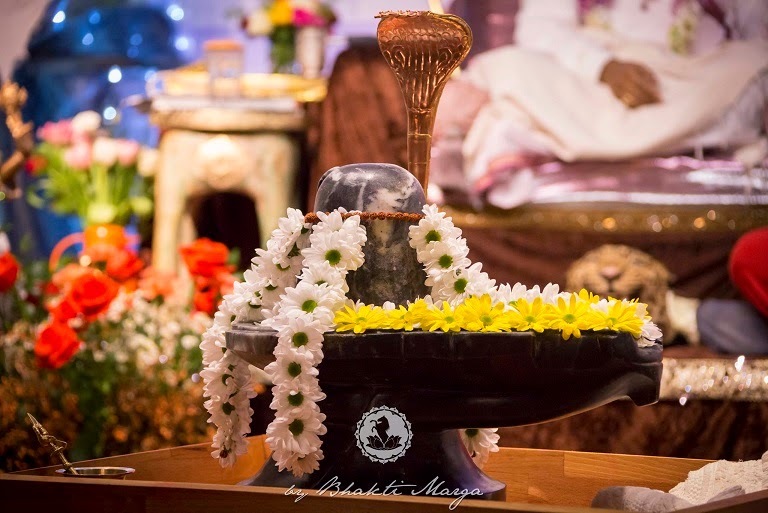 The main part of the five prayers is an abishekam performed on a special Shiva Lingam, blessed by Mahavatar Babaji and named Mrityum Bageshwar (The Lord which is above death), after one of the famous twelve Jyotir Lingams placed at Maha kaal Temple, in Ujjain, India. (JL 3, p. 200). 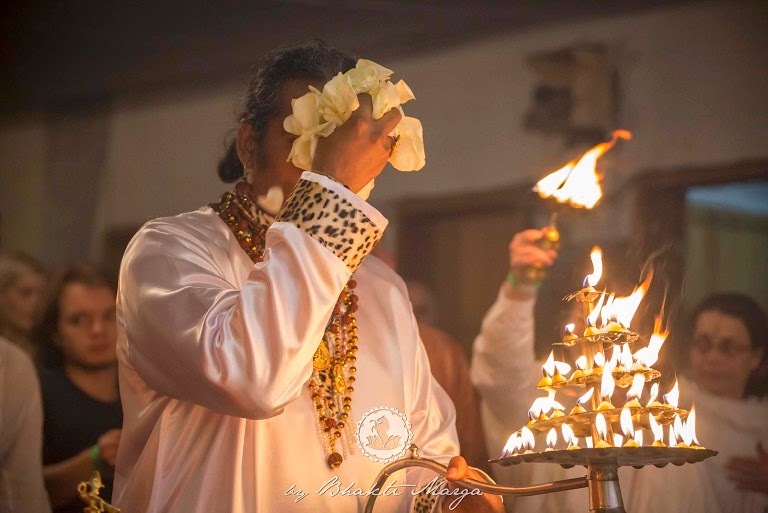 Throughout the night, while the abishekam was being performed, bhajans and songs were sung in particular different versions of the mantra OM Namah Shivaya, and praises to Lord Shiva, namely Shrī Shivarāmāshtaka Stotram, Shiva Panchakshara Stotram, Rudra Ashtakam, Chidananda Rupa Shivoham Shivoham. The Sri Rudram and Sri Rudra Laghunyasa were also chanted, and at the end of each pahar everybody has sung the Lingāshtakam. “I wish you all an auspicious Shivaratri. I will not repeat myself like every year. 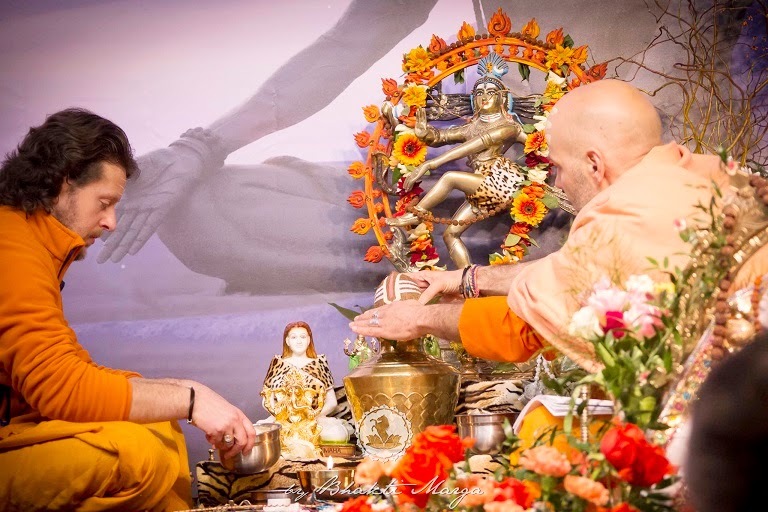 You know what Shiva stands for – the destruction of the pride and the ego. And on this particular day, by His Grace, in the form of Rudra He destroys the mind, the ignorance inside of you, so that your heart can take over and rise to the Feet of Lord Narayana. That's why we stay throughout the night praising His Name chanting OM Namah Shivaya, Shivaya Namah OM. Like this the mind is cleansed, transformed and becomes an offering to the Feet of the Lord. 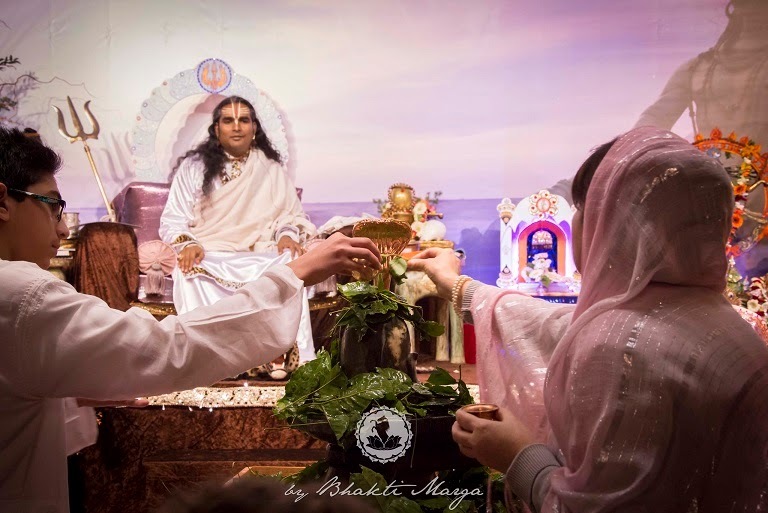 As the Lord offers Himself completely, in this Shivaratri offer your mind! In the mind there are so many unwanted things. So offer it to Lord Shiva. He destroys all the negativity, so He shall destroy all the pride and ego inside of you. 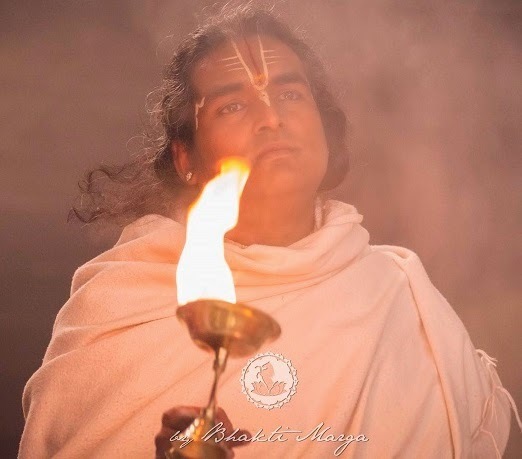 As you are cleaning Him, bathing Him, He is also cleaning you of the inner impurities, the tendency of past lives which act very much on the mind." 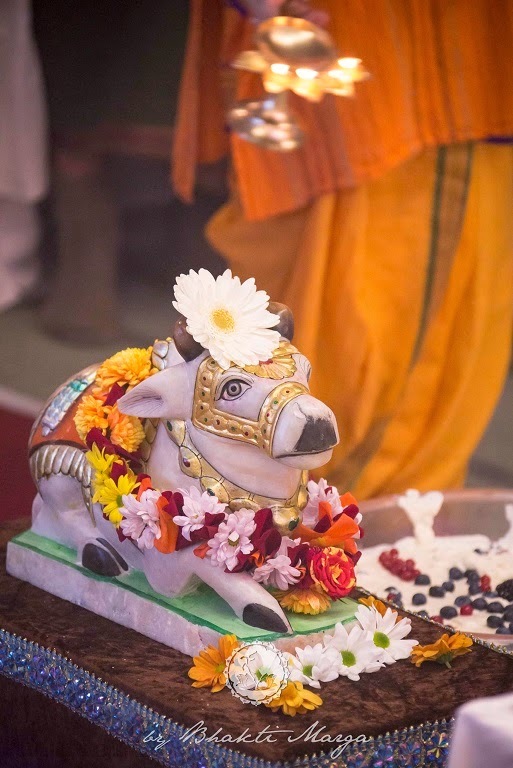 "Nandi (the bull, Lord Shiva's vehicle) has chosen the right way. What does he do? 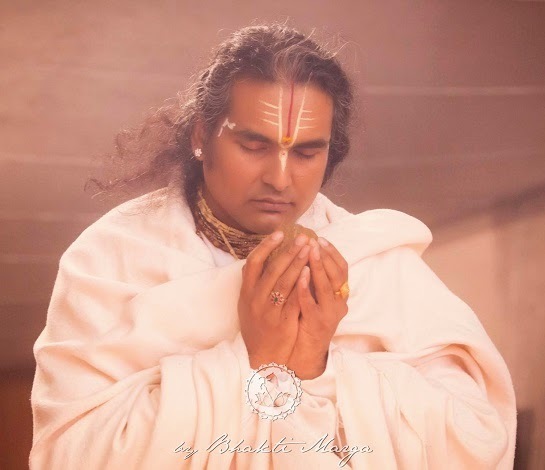 He is in front of the Lord Shankara with his mind focused on Him. Like that your mind has also to be focused on the Lord! Your mind has also to be focused on the Feet of the Guru! Then you become like Nandi. Not as an animal. That is past. Finished! That tendency of animal quality is long gone from you. You have gone through all this and you got an human birth. As the shastras say, the human birth is the greatest gift which God has given you. Do you want to waste it? It's your choice. But if God has called you on the spiritual path, due to the good punya from past lives cleanse your mind, cleanse your pride, cleanse you ego. Get rid of these things. Be free from that and He will reveal Himself to you. The Lord is ready to give Himself. But are you ready to give yourself? Don't just say, ‘yes’, ‘yes’. No. The ‘yes’ has to be from deep within your heart, from deep within your soul itself. 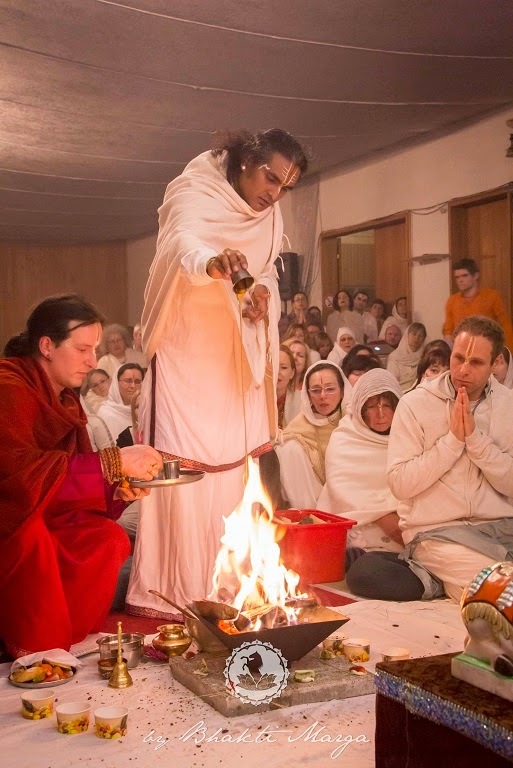 Then, as He brought you on the spiritual path - due to your punya; like that He will take care of everything for you!" 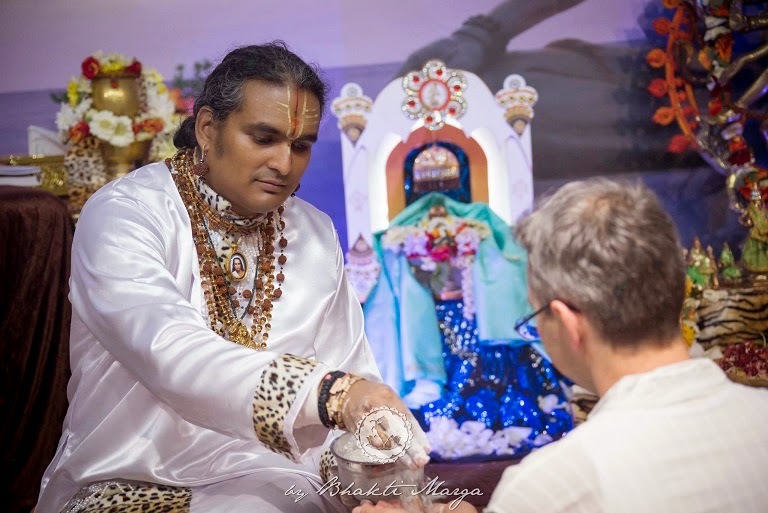 The Shivaratri celebrations ended with a special blessing of Sri Swami Vishwananda: He chanted a prayer in Sanskrit while everybody was bowing down, and at the end everybody received an handful of blessed vibhuti directly from His hands. “May the blessing of Lord Shiva and Parvati be on you always. May your mind be purified! May your heart be purified! May your soul be purified! May you attain the goal of life which is the Feet of the Lord!" 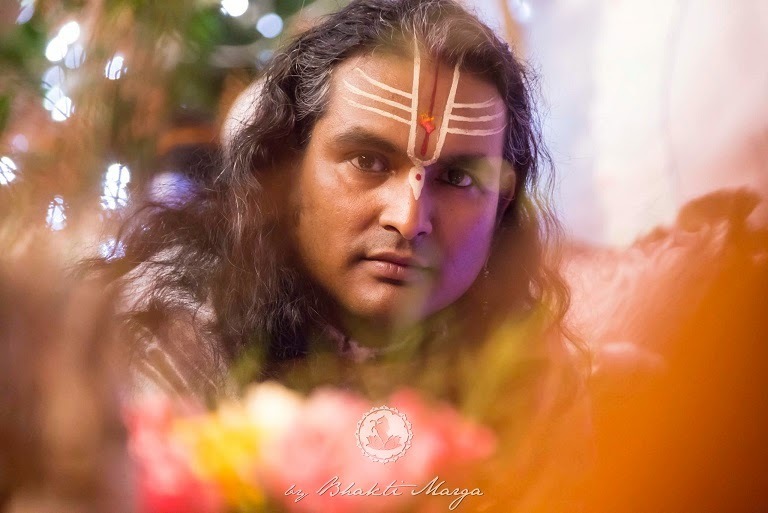 Shivaratri: A first time experience.